Every time I find myself in the baking isle at the supermarket, my eyes drift up to the stack of marzipan boxes on the top shelf. I often wonder if the orange and white boxes are the very same from week to week, or if they are in high-demand and when the boxes have all been sold, marzipan-seeking customers skulk off past the dried coconut, chocolate chips and sweetened condensed milk, looking in vain for a culinary alternative. This week, two boxes came home with me: in part to see what I could do with marzipan, but also for a visual break in the usual wall of perfectly aligned boxes all the way from Denmark. 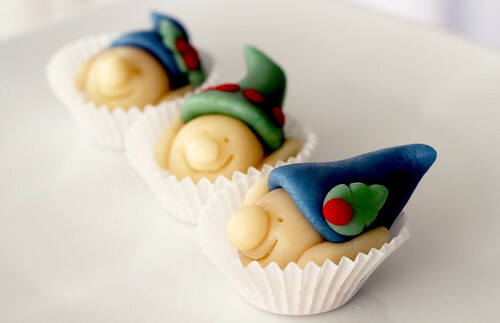 Marzipan is a sweet paste made of sugar and almond meal. It’s softer than Fimo Modeling Clay, but slightly stiffer than Play Doh. Out of the box, marzipan is wrapped in an airtight foil sleeve. It’s normally bone-color, but takes food coloring extremely well. It can be shaped, kneaded, rolled and is found in chocolates, on cakes, and molded into shapes like fruits, vegetables and even animals. 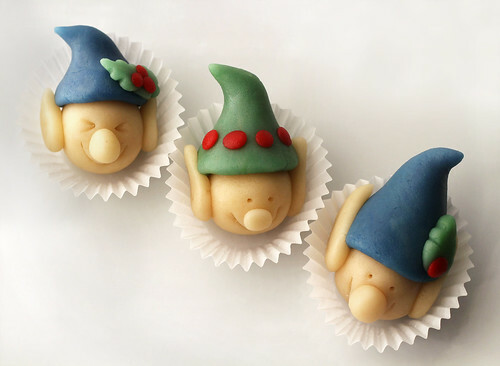 I wanted to make marzipan elves. I love working with clay, and little edible elves seemed like a fun food craft, and a potential gift for a sweet tooth with a sense of humor. 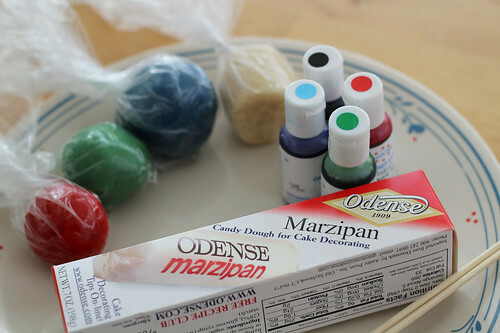 After working the red, blue, and green food coloring into the marzipan (reserving a large piece without any color), I wrapped everything up in individual plastic bags. Marzipan seems most pliable when it has warmed up slightly, but I was wary about leaving it out in exposed air, as that seemed to make the texture a bit sandy. For the ears, noses, and elf hats I rolled the paste in my palms until it vaguely resembled the pointy bits and pieces I needed. Using a wooden skewer, I made the eyes, and mouths and shaped the holly leaves for the hats. To ensure that noses and ears stayed put, I scored them slightly before pressing them together. After making my first three elves, I was overjoyed by their cuteness, and the ease with which they came together! I had to stop to take a few pictures, and nibble on the yummy scraps. I made the three elves pictured here in about 30 minutes. This would be a great craft for kids. In fact, I would LOVE to see what my Play Doh-loving nieces would come up with in marzipan. 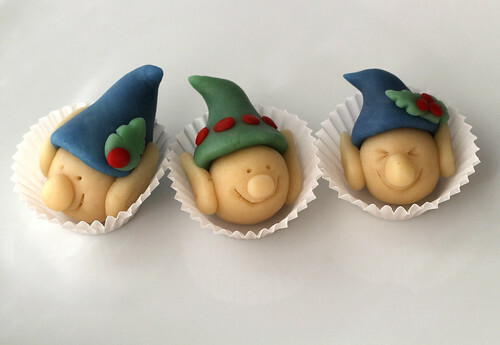 I have several left-over balls of colorful marzipan left, wrapped up in the refrigerator for more edible modeling later this week, but for now, my three elves are exactly what I was trying to accomplish! I just hope that whoever ends up with these little guys in their stocking, loves them as much as I do! 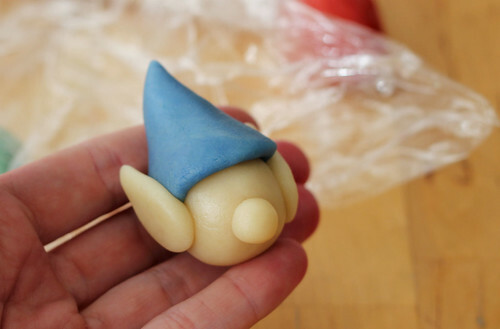 For your own edible sculpting, pick up some marzipan and HAVE FUN! How cute! I love that it looks like Fimo.